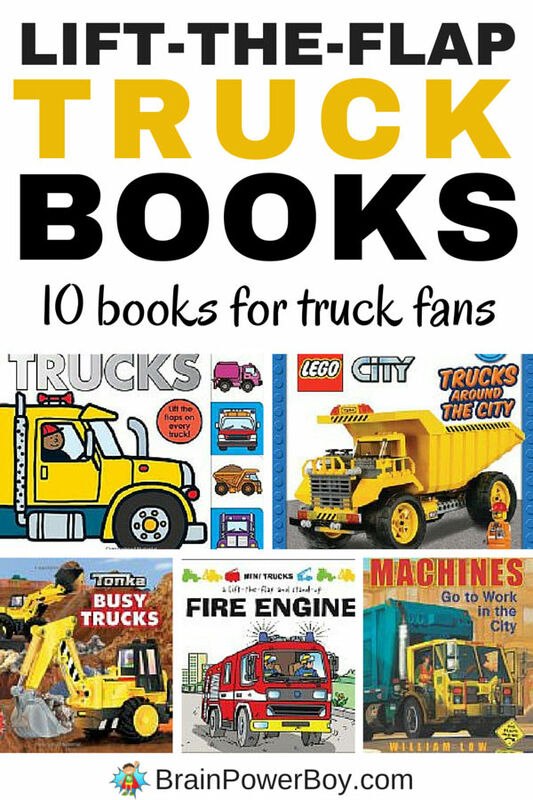 Interactive Lift-the-Flap Truck Books for Truck Fans! I went searching for some Lift-the-Flap Truck Books that I thought your boys would really enjoy. My son loved lift-the-flap books when he was young. They have that wonderful reveal moment. Even if they know what is under the flap it is still a bit exciting to open it and take a look. These books are also great for a bit of hands-on fun while reading. This list is part of our growing Best Books for Boys articles. Click the link to see all of the lists – there are a lot! I found a LEGO one! Lego City: Trucks Around the City has giant flaps and very cool pictures of LEGO trucks. Lift-the-Flap Tab: Trucks allows kids to take a peak inside the trucks! They are going to love that. There are images of the trucks with a large flap that lifts and lets you see what is inside a fire truck, mail truck, construction truck and more. I don’t know about you but we love Tonka trucks! If you have a boy with a selection of Tonka trucks this book is a great choice. It features the different trucks and includes flaps for workers etc. Over 40 flaps in all. Yes, it is commercial, but it is well done and Tonka fans will love TONKA Busy Trucks . This one should probably come with a cuteness alert. Sweet for toddlers and preschoolers Tons of Trucks features adorable animals and their trucks. Another book that lets us take a peek inside vehicles is Emergency Vehicles which lets the reader open flaps to reveal more about an ambulance, police car, fire engine, rescue helicopter, lifeboat and more. This is an usual idea! In Mini Trucks: Fire Engine you lift the flaps to reveal the answer to questions. Here is the unusual part – when you get to the end the wheels come out and the book reveals a stand up model of the fire engine featured in the story. Neat! If you have a boy who loves food and trucks try Food Trucks! : A Lift-the-Flap Meal on Wheels! . Super cute! and 10. The illustrations of these two books make them stand out. Machines Go To Work and Machines Go to Work in the City have gatefold pages which open on each side of a page to show a three page spread. These detailed books are winners. Recommended. When my boys were little, they LOVED lift-the-flaps books. How fun that there are so many about trucks! My son would have loved these when he was younger. I think I actually recognize a couple titles that were on our shelves. Thanks for sharing with #What to Read Wednesday. What a great list! My boys love trucks and lift-the-flap books. I’ll have to buy a few of these for them for Christmas. Thank you for sharing at the #Made4Kids Link Party!